Cameras That Utilize B4 2/3 Lenses? 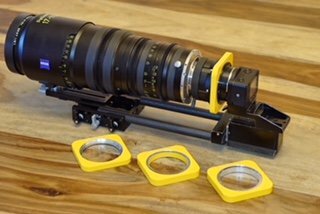 Other than the F900(and similar), F23, and URSA mini; could anyone list out some other modern options which utilize this form factor of lens? There is a version of the Panasonic Varicam 35 that has a camera head for b4 mount lenses. I'm not sure that they still make it, but if they have some around they may want to get rid of them :) Try contacting them. There are new 2/3 cameras used by broadcasters. These are different to the current fashion ion for large sensor cameras, but you can get B4 adapters for the latter. It's common for wildlife people to use the B4 zoom lenses on Super 35 cameras with an adapter,. of course, shallow DOF is of little interest to them. you can use the B4 lenses with M4/3 cameras with an adapter. if using larger imager than 2/3" you may need to use extender to cover the full imager. You can put them on any of the APS C s35 sensor camera,s with adaptors .. but they cost a fortune.. weight a ton and eat up 2 or 3 stops or something crazy like that.. for camera,s with "centre crop". mode you can use a much smaller adaptor .. that only loses about ⅔ of a stop.. as your down to s16 size.. Detroit was shot with s16 zooms on crop mode Arri Mini.. But ⅔ lenses were designed for 3 chip CCD camera,s.. some people say this effects quality ..
What's the asking price on that? What advantages does that hold over f900? Sony SRW-9000 records HDCAM-SR instead of HDCAM. HDCAM isn't a very good tape format for origination -- it's 8-bit 3:1:1 -- and the F900 can only record Rec.709 color and gamma, whereas HDCAM-SR can record 10-bit 4:4:4, and the SRW-9000 can record a wider color gamut than Rec.709 in log gamma. Basically the SRW-9000 is an F35 but the HDCAM-SR deck is built-in rather than attached. It uses a single 35mm sensor rather than a prism block and three 2/3" sensors. I had thought the b4 version of the 9000 used the prism and separate sensors some ones as the F23. Is that not the case? I own the 9000PL which as the name suggests is a PL mount, it has the same sensor has the F35. Looks like there was a 2/3” 3-sensor version. Thanks for all your answers but I'd like to re-word the question. Is there a point in seeking out any other camera in the year 2018 if I have a plan in place to acquire an URSA Mini Pro with a B4 mount? It depends on what you want to use the camera for.. It honestly feels like the UMP covers... everything. Whats the sensor size you have to match..? if its s35m you will need an expensive heavy adaptor .. and lose a shed load of light.. if it has centre crop .. much smaller less expensive adaptor .. and light loss.. The mini pro seems to be a really good option, especially since you can get other mounts for it is well. I am assuming you realize that you will have to shoot HD or 2K on the mini to avoid vignetting. Also the mini is a single sensor and not a 3 chip like the b4 lenses where designed for. I do see that the mini b4 adapter has optics to correct for this so a concern I would have is that there might be a little bit of a quality loss. I see that BM claims that there is no IQ loss using the adapter but would recommend trying to confirm that before hand. Other than it seems like a great option a single camera that can be EF, PL and B4. 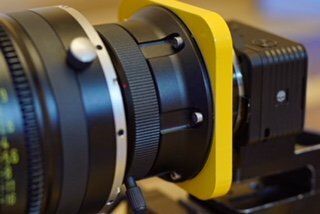 I'm on the 3rd version of a prototype adapter which mates B4 to 1" sensors (in the case the Sony RX0 modified with Backbone Ribcage - which has horrible rolling shutter by the way, sort of surprised me). I'll share more details with you when I have something ready to show. If it doesn't work out, my 17-112 will be up for sale. Bad news is that it does vignette on a 1" sensor, even when using a 1.1x optical expansion block with color phase correction. a 1.4x adapter would cover 1" completely, but then with the loss of light and image degradation, somewhat negates the effort - good solution if you already own the glass, but I'm trying to make using Zeiss Digi an attractive option to seek - attractive especially given the current depressed pricing of Zeiss Digi series of lenses. There are (hopefully) some new cameras coming soon with the Sony IMX255/533 that should offer some cropped sensor options offering perfect coverage for my setup. after a few test jigs, finally came out with something that works - focuses to infinity at the infinity mark, seems to be parfocal, but... did vignette with the Ribcage RX0's IR filter in place - when removed it does not! 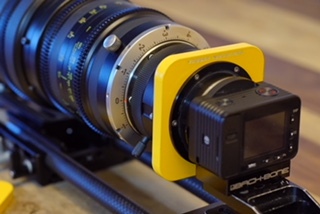 Blackmagic URSA PL B4 adapter with m43 mount - provides 1.1x expansion, color correction optical block, and minimal light loss compared to other 1.4x adapters. If it will stop raining here, can try to go out and get some outdoor test shots.